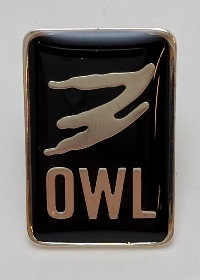 Original Our Whole Lives (OWL) Recognition Lapel Pin in black. Original Our Whole Lives (OWL) Recognition Lapel Pin in black. This pin is suitable for presenting to all age levels as a way to honor and recognize those who have completed any level of the Our Whole Lives program. This pin also makes a lovely facilitator gift. It features a convenient butterfly clasp.